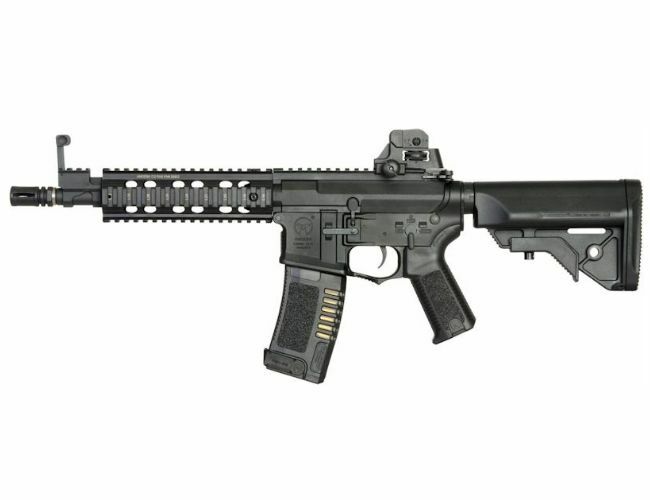 This is a lightweight M4 AEG rifle. This Airsoft rifle has a smooth change spring mechanism which will allow you to upgrade the FPS rate or lower it. It This gun has a quick change spring allowing the user to quickly upgrade the FPS rating of the gun in quick time. This weapon has the EFCS gear box which is the firing control box and allows the gun to be set to full auto, 3 rounds bursts or semi auto (Electronic Firing Control System), which allows the gear box to be programmed to be Semi, 3 round burst or full auto.This electronic trigger gives more control and fast action. Amoeba AM-008 M4 Black - Carbine Version Made by Ares. Safe mode Semi mode or Fully Automatic mode. Feet Per Second 310fps to 320. Alloy Top Rail, Stock Tube. RIS and Internals, with tough Polymer stock and receiver. Adjustable hop up and spare mags available. Knurled pistol grip and fip iron sight. Magazine 300rd Hi-Capacity. Works with most compatible M4 / M16 Series. Gearbox: Ver 2 Full Metal. Battery: 9.6v 1600mAh Small Butterfly Type.